Voltaire was a French philosopher and historian. His birth name was François-Marie Arouet and he is considered to be one of the best Enlightenment writers because of his versatility as a writer and his ability to create works in nearly all literary forms, such as poems, plays, essays, novels, along with scientific and historical works. He is most famous for writing Candide, which is a satirical novella. Voltaire was born in Paris to an upper-middle class family in November of 1694. His father was François Arouet and his mother was Marie Marguerite Daumand. The couple had five children with Voltaire being the youngest. His mother died when he was seven years old, and following her passing, Voltaire became close to his very free-thinking godfather. He was educated at the Collège Louis-le-Grand by the Jesuits from 1704 to 1711. He learned Greek and Latin and later, he became proficient in English, Spanish, and Italian. When he left school, he decided to become a writer, contrary to the plans of his father who expected him to become an attorney. Voltaire pretended to be working in Paris as a notary assistant, but he spent most of his time composing poetry. As soon as his father discovered what he was doing, he sent him to Caen, Normandy, to study law. However, he kept on writing, creating many essays, and historical works. His intelligent wit made him very popular with many aristocratic families that he spent time with. His father found employment for him as the French ambassador’s secretary in the Netherlands. There he met Catherine Olympe Dunoyer, a Protestant refugee from France. They fell in love and planned to elope, but his father forced him to go back to France. 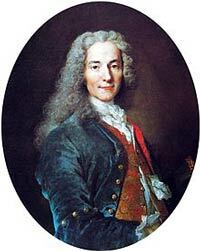 Nearly all of Voltaire’s early life was spent in Paris. Early on, he had problems with officials for not only very mild critiques of the French government, but also for his religious intolerance. Voltaire’s activities resulted in several imprisonments and exiles. His satirical verse regarding the Régent resulted in his imprisonment for eleven months in the Bastille. When he was there, Voltaire wrote Œdipe, his debut play. Its success quickly established his reputation. Voltaire’s philosophy was based upon on rationalism and skepticism. Despite his fondness for reason and clarity, he often contradicted himself. Voltaire would state that man’s basic nature could not be changed and then sometimes he believed in progress as well as the progressive humanization of society by art, science, and also commerce. In religion, Voltaire believed that Christianity was good for tailors and chambermaids to believe in, but he advocated that the elite have a simple deism. He was against atheism and materialism as expressed by Helvétius and Holbach. His statement, “If God did not exist, he would have to be invented,” is well known. Voltaire thought the French bourgeoisie was not very effective, the aristocracy was too corrupt and parasitic, the masses too superstitious and ignorant, and that the church was only valuable as a counterbalance against the monarchy. He did not trust democracy, and he believed that it propagated the commoners’ idiocy. He also believed that philosophers like him were the only ones that could bring about change because it was in the monarchy’s best interest to enhance, not only the power, but also the wealth of France. He essentially believed that the monarchy was the best way for progress and change. Voltaire’s major works fall under four categories: plays, poetry, philosophical works and historical works. His most famous poetry contains the epic poems Henriade and the incomplete The Maid of Orleans. His body of writing includes the noteworthy historical works of The Age of Louis XIV and his Essay on the Customs and the Spirit of the Nations. Voltaire’s well-known philosophic works were the short stories Plato’s Dream and Micromégas. His most famous work, Candide, is an interesting fictional story about a wandering traveler who is involved in many farcical adventures. The work satirizes Gottfried Leibniz‘s philosophical work. It starts when Candide is a young man who has lived a very sheltered life and has been influenced by Leibnizian optimism by Pangloss, his mentor. It goes on to describe the sudden end of this lifestyle, and then his slow, unpleasant disillusionment when he experiences and witnesses several hardships. Voltaire ends Candide with an outright rejection of optimism while promoting more practical principles. Voltaire was exiled in 1715 to Tulle for making fun of the regent of Orleans. He returned to Paris in 1717 and was arrested again. This time he was sent to the Bastille for one year on libelous poetry charges. In 1726, he was once again sent to the Bastille. He stayed there for a couple of weeks and then was sent to England. Voltaire remained there for three years. In 1733, his Letters on the English Nation infuriated the French government and the church which forced him to escape to Lorraine. Voltaire stayed there for 15 years with Emile de Breteuil, his mistress. In February of 1778, he returned to Paris for the first time in 20 years. In May of that year, Voltaire passed away in his sleep. At the time of his death, the French people had begun to regard him as a hero and literary genius.